I write this on April 12 and it's -25C outside. The winds are calm, so there's no windchill to add to the punishment, but it could hit -39C. This is spring in Nunavut, by the way. Realistically it's another two months until we'll start seeing regular above 0 temperatures. It's never the cold that sinks you in Nunavut, it's the duration of the cold that ends up doing the trick. This has been a short winter by Iqaluit standards because of the massive mild spell we had in November and December. It's also why we need a vacation. Now, I've been cautioned by a friend about talking about vacations as it has been pointed out that not everyone gets one, let alone the two or three a year Cathy and I can normally squeeze out. Which is true. I recall when working for the Packet and getting a whopping two weeks off a year and my vacation consisted of going to St. John's to stay with one of my parents for two weeks. Because when you're making $19,000 a year, the around the world vacations don't really drop into your lap. However, we have the money now. It's one of the perks of living up here. And a trip out every now and then is a sanity measure for us. People react different to living in the north. Some move here and they never want to leave. Their idea of a vacation is to hop on their ski-doo, or their boat, and zip on up the bay to spend a few weeks at their cabin. Because, you know, what you need when you live up here is to get away from it all. But people do it and that's cool. Others come up here and last three weeks. Or three minutes. There's the story, true or not, of a teacher arriving in one of the Kivalliq communities, walking off the plane, looking around and then getting back on the plane and leaving. I repeat this for everyone who ever thinks about moving here - it's not for everyone. And for those who stay, you may love the place to pieces. But I'm willing to bet most still need a break from it all. And that's us. A couple of times a year, it's nice to go somewhere. Somewhere new and exotic if at all possible. And one of the great...resentment is too harsh a word, but certainly envy, of my late 20s and early 30s, was watching friends go all over the world. I had friends in the UK, Africa, southeast Asia, the middle east, California....everywhere it seemed. I had Clarenville and St. John's. So we're making up for some lost time. Besides, I haven't had a vacation in nearly a year. The last time I sat around and did nothing was when we went to Florida last April for a week. So yes, a break. Something other than the ice and snow. So where are we going? What exciting and exotic land are we off to? Yeah, I know. Cathy's parents are there so we're going to go and crash with them for a week like we did last year. Although last year I had a hard time sitting still. I had been unemployed for several months, so I didn't really need the break. This time, I suspect I'll have no problems flaking out on a beach with a book. Or possibly an iPad 2 if I can find a store there that's selling them. Yes, relaxation is the name of the game this time. Oh, and in case anyone is thinking the house is unattended for that week, well, we have a vicious attack dog (well, he's a noisy fucker at least), plus a house sitter. So if you were thinking of breaking in, well, no. I'll let you know if I see any true weirdness. It's Florida and it's Easter, so I'm willing to bet the odds are good. When I read this story about Kiss playing Grand Falls-Windsor my first reaction was to mock. Well, all right, I might have already mocked on Twitter. But that was mainly due to the absolutely ludicrous lede. I don't know if it's Ms. Colbourne's fault or if she has a desk to close to Steve Bartlett at the Telegram and suffered a temporary loss in sanity. Look, most people don't consider Kiss to be the most influential rock band in history. Virtually no one does. If you're going to have discussions about most important rock bands of all time then you mention The Beatles, The Rolling Stones, The Who, Led Zeppelin and The Ramones to start with. Kiss is a great rock band in the same way that Def Leppard and Bon Jovi are. And yes, that's meant exactly as backhanded as you think. Now, the easy thing is to mock the band for playing Grand Falls. I've long had the theory that Newfoundland is the elephant graveyard of rock music. Bands who were big once stagger to the island, trying to desperately grasp one last burst of glory before wandering off into the Atlantic to die. Or shot out of mercy. It doesn't always work. April Wine and Trooper keep playing there despite the best efforts of some to put them out of their misery. But it's rare that a band in their prime plays in the province. To say Kiss is past their "Best By" date would be an understatement. I'm pretty sure they haven't had a hit in 25 years. Oh, I'm sure it'll be an entertaining enough show for the devoted, but if I was in Newfoundland would I pay $70 to go and see them? Hell no. I wouldn't pay them that much if they were actually in St. John's. Paying to see them in Grand Falls? Not in this lifetime. But an interesting thing happened on the way to this blog post, which has been brewing for a few days. I read this article from Rolling Stone the other day about Bob Seger. It's a great interview (how the hell is his stuff not up on iTunes) and talking about how he's not doing this too much longer because, well, he's 65 years old and chain smokes and playing for a couple of hours on stage kind of hurts these days. Seger probably hasn't had a hit since 'Breakdown' from the Beverly Hills Cop movie. For that matter, Jackson Browne is on tour right now doing solo acoustic shows. I have two of the solo acoustic albums and they're fantastic. But again, no idea when he last had a hit song. So I can't get up on my horse too high about people willing to pay to see Kiss. If that's your thing, more power to you. I'd pay good money to go see Seger in a second. I think Browne was playing in St. John's and tickets were a pretty penny. So logically, I can't really mock if you're willing to drive all the way to Grand Falls and stand outside for hours to watch Kiss play a set. But understand, I really, really want to. I mentioned we had a new restaurant in town, with the introduction of Yummy Shawarma. I've eaten there twice more since the last time I wrote about it, and I still like it quite a bit, although I need to ask them to go light on the garlic sauce. I love garlic, but it repeated on me something fierce. Plus, I'm sure I wasn't a joy to be around a few hours later. However, if the fates giveth, they also taketh away. And no, not just with the loss of Fantasy Palace. Cathy and I like going to the Gallery Dining Room at the Frobisher maybe once a month. It's an expensive restaurant, but if we have the money and we're in the mood. This evening we had the added bonus of being able to go and not have it cost us anything. As part of my Glorious Curling Victory last weekend I go a $120 gift card for the restaurant. Which, given the prices at the place, is almost exactly enough for supper for two. The problem with the Frob is they tend to switch up chefs once or twice a year. And the last few have not had a curb upwards in menu quality. The latest is apparently a big fan of seafood. For example, the only appetizer that was not seafood was a Caesar salad. Most of the main courses are now seafood. They changed the cut of beef for the steak I used to get and it's not nearly as good now. And for $50, I'd like a slightly better quality steak than that. Or, for that matter, more than a few scraps of potato and some asparagus as a side. Cathy spend $30 for essentially vegetarian pasta. Lovely and all, but they at least used to offer to toss in a bit of chicken for a few dollars extra. Not so much anymore. So yeah, the Frob is off the list for the next little while. Normally not a big deal, but when you have something like seven restaurants in town, losing one is a bit of a blow. Then again, in about a week's time, we're going to overdose on restaurants. Ever time we go out and friends or family are around, I think they're bemused/horrified by the number of restaurants we go to. I mean, we don't even make the pretence of picking up some groceries. We so rarely get to eat out or sample new foods. So yeah, we'll be hitting a few places when we start our vacation. And where are we going? Well, more on that next time. I've written before that telecommunications up here tend to be a little...different, than what most people experience down south. If I had a dollar for every time I read a tweet saying how much Northwest Tel sucked, I could pay off my mortgage in about half the time. To say there is hatred over NWTel in Iqaluit would be an understatement. It mostly starts with how bad the internet is. If you're paying $120 a month for internet and suffering with a 10 gig cap, you'd at least like the speed to be not disgusting and for it to be reliable. That doesn't happen very often, alas. Hence our reasons for switching to Xplorenet last year. The other thing that's cursed on is the cell phone service. Iqaluit only got cell service in the past five years, I believe. I know there wasn't any when we first moved here in 2005. And if you listen to some people around town, what's here now isn't all that great. Let's take today, for example. Blackberry service in town was almost completely useless. And why was that? Because there was a conference in town. That meant a couple of hundred extra people in town, all checking their Blackberry. Which, it seems, overloaded the local network's ability to handle traffic. So there were a lot of grumpy people around town today. On the upside, we have a new restaurant in town. Anywhere else, not such a big deal. 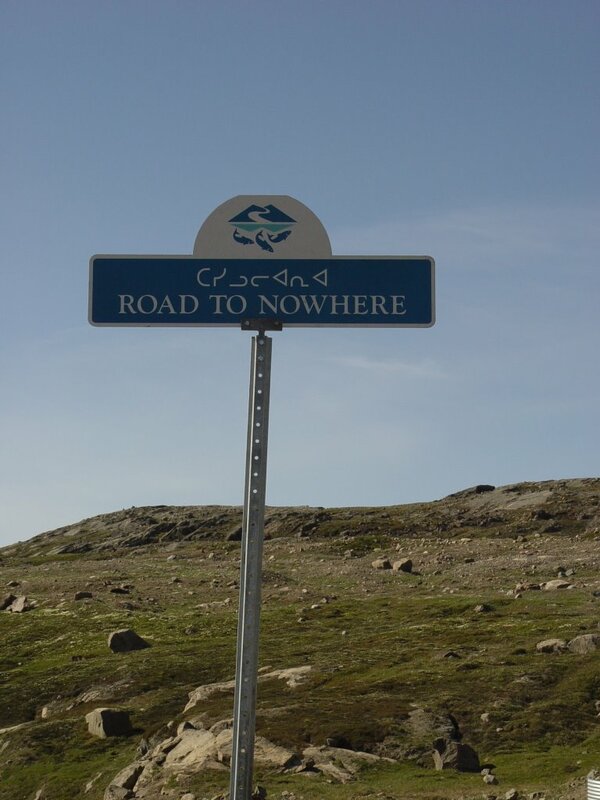 New restaurants don't open every day in Iqaluit. They don't open every year, for that matter. But for some reason, a family decided to open a shawarma and donair shop in town. Everybody is pretty excited by this. Cathy and I have eaten there twice and it's tasty. Judging by the line-up at lunch time today, they're off to a good start. It does mean the end of another long term establishment in town, though. Fantasy Palace, a long-time coffee shop in town, is no more. So no longer will new arrivals leave the airport, glance to their left, see the name Fantasy Palace and assume it was the local strip joint. It's the loss of a local landmark and the first local coffee shop killed by Tim Hortons. I don't think too many people were surprised to see it go, to be honest. But hey, shawarma. And the Grind and Brew started serving pizza late last year, which is also not bad. If we could get some good Mexican and Indian food, we'd be all set. So here we are at the end of the another season. This normally means bad things for the Doyle family. Last year we had heart attacks, a frame up for a murder and Ron Hynes closing out the season. So what's going to happen this time? Well, Tinny and Des get kidnapped, an old partner of Jake's comes back looking to settle a score and about the only person safe for next season appears to be Jake. Everyone else is up in the air. In other words, another eight months or so of pure torture for fans of the show. Anyway, let's get started. So it seems back in the day, when Jake was with the RNC he had a partner - Crocker - who was a wee bit of a scumbag. And Jake helped to bring him down. The only thing, of course, is that he got away before they could arrest him. Now, 10 years later he's decided it's time to come back and take care of Jake. And the best way to do this is to kidnap Tinny and Des and force Jake to rob several million dollars for him. It's an intense episode, which is fortunate because if you pause and stop for a minute and actually start to think about it, you realize it's also a pretty stupid one. I'm tempted to use the phrase "intensely stupid", which is accurate, just not in the way you would normally think. This has always been one of little annoyances with the show - good stories, but you sometimes get really stupid plot points. Jake's ex-partner kidnapping Tinny and getting Jake involved in a heist he didn't want to save her life is a good idea. It's just the execution that was weird. The robbery was weird, Jake turning on Crocker and getting him thrown in jail feels just like an excuse to get the police involved in the plot and to stage a dramatic jail break later. As I said, intense, but not all that smart. This was an episode that counted on people who are supposed to be smart being very stupid. When the cop at the end compliments Jake for being clever, I burst out laughing. However, I will give props to a few things. First, Paul Gross looked like he was having a blast being a bad cop. So here's hoping they can find an excuse to bring him back sometime soon. Bring him back instead of that idiot author character. Secondly, for a show settled into a nice, comfortable routine they certainly blew it up really good in the last 10 minutes. Jake possibly rejoining the police, Leslie fired, Tinny off to Europe and Mal and Rose running off into retirement. Now, the reset button can be hit quick enough, but it's an interesting cliff-hanger to end the season. 1. The actual mayor of St. John's, Doc O'Keefe, was in the scene at the Duke. So was John Crosbie. It occurs to me that Andy Jones hasn't appeared in the show yet. If he does, clearly he needs to be the premier. It would be a lovely in-joke, as he was the premier during the movie Secret Nation. 2. Trimmed Navel Beef (the name of the salt meat in the warehouse) was a local band that was quite popular about 10 years ago. Your in-joke for the week. 3. There was clearly a bit of money blown in this episode, what with the big car smash-up on Water Street, plus a Pogues song ("Dirty Old Town") to close out the season and a Bruce Springsteen song ("Mrs. McGrath" off the excellent Seeger Sessions recordings) for the dramatic jail break. I'm always surprised by the music choices on the show. They're mostly excellent, but I always figured they'd use more local music. I'll do a wrap-up of the season in the next few days. "You can shoot me now if you want to." 1. Clare first brought Indigo's health to my attention a few days ago. I didn't know her as well as some other northern bloggers, like Jen and Clare. But she always swung by the blog, had a few kind things to say or interesting observations to make. I was saddened to hear about her death. It's going to be an absence in the local blogging community, but more importantly it's the loss of a good friend and a beloved family member. My condolences to everyone. 2. When all hell broke loose in Japan last month, I remember reading a quick article with someone saying they were actually more in favour of nuclear power after the incident than they were before. Which was a curious thing to say in the wake of all the panic that was going on. But really, he had an interesting point. The reactor survive a 9.0 Richter Scale earthquake. It was only when the tsunami wave hit and knocked out back-up generators that all hell broke loose. Geoff Meeker, who writes a media column with The Telegram, did a piece expressing his disgust with a lot of the fear-mongering reporting that happened after the plant incident. But it's this piece with Bob McDonald of CBC's Quirks and Quarks that really impressed me. McDonald explains what happened with the reactor better than anyone else I've read so far and makes an interesting and compelling argument on nuclear power. I'm not saying let's rush out and build nuclear reactors everywhere. But I think after reading this I'm a little more open to the idea of nuclear power than I was before. And if nothing else, he's a good place to start on any debate on the subject. 3. So after Southwest Airline had a few incidents involving a Boeing 737 I was wondering if there was going to be a warning. Lo and behold, there is. But the thought that crossed my mind was that both First Air and Canadian North use older 737s, so were any of those planes going to be affected? Thanks to the power of Twitter, I posed that question and got an answer. First Air doesn't, but Canadian North has one. Which I'm willing to bet is being inspected as we speak. So that brings up two things - god love Twitter, which is a brilliant way of throwing questions out into the wild and getting answers. And secondly, both airlines really need to get some new planes. Seriously. First of all, no Republic of Doyle review again this week. Sorry. My curling game got shuffled from Thursday to Wednesday. By the time I got home, there was 20 minutes left, which I watched and seemed fine. But I certainly didn't see enough to review or comment on. However, I will make sure to catch the finale this Wednesday. Can hardly miss the last episode of the season, can I? But yes, I've actually been busy with curling this week. I haven't written about it much this season because it was a fairly frustrating year. Teams I tried to put together for the mixed championship and the Dominion both collapsed. Every year there is a team that always seems to be caught on the wrong end of the stick when it comes to having games cancelled because teams folded or people are away on duty travel. This year, it was our team. And then, to put one final kick in the groin, we suffered what was, no kidding, my single worst loss since junior high. We were blown out 12-0 in five ends on the second last game of the season. So when we headed into the play-offs, I was not that optimistic. And yet, strange things started to happen. Getting regular games gelled us as a team. We won the first game pretty easily. Despite blowing a 6-1 lead, we won the second game. The third game was against the second seed who had smacked us around pretty good early in the season, and we held on against them. Then we faced the #1 seeded team who beat us 12-0 and got a measure of revenge by knocking them out. And then we managed to win the final. We won our league night. Six years I've been curling at the club and I've made it to the final twice before, but it was nice to finally win one. But what was even nicer was to get one for the rest of the team. Mark, who kept laughing and shaking his head in disbelief that we pulled it out. Troy, who has only been curling for two years. And Ashley, my rock at Third, who ran home to boast to her husband that she's now a curling champion. I figured that was pretty much going to be the end of it. But we had the Canadian North bonspiel this weekend and we agreed to put a team in weeks ago. But after winning the league championship, this was for giggles. I think we were all hoping to be lucky enough to win a plane ticket (plane tickets are offered up as door prizes. This prevents stacked teams and keeps things a lot more fun) rather than winning the thing. We won the first game pretty easily, but the second game was against two of the best players in the club, so I figured that was going to be the end of that streak. But we won (secret strategy, make sure they get drunk the night before, have to get up early to work on the ice and play still feeling hungover. I recommend it). The third game went to something ugly called Skip Stones. It's the equivilent of a shoot-out in hockey. Each Skip gets to throw one rock to break the tie. Closest to the button wins. I managed to get my shot about 6 inches further (I nearly killed my sweepers) than the other skip. And then in the final, we got in trouble in the early ends. I gave the team a motivational speech (I won't say what it was, but it got them to laugh and it got them to kick it up a gear.) And next thing you know, we won the bloody thing. Two championships in less than a week. Unreal. 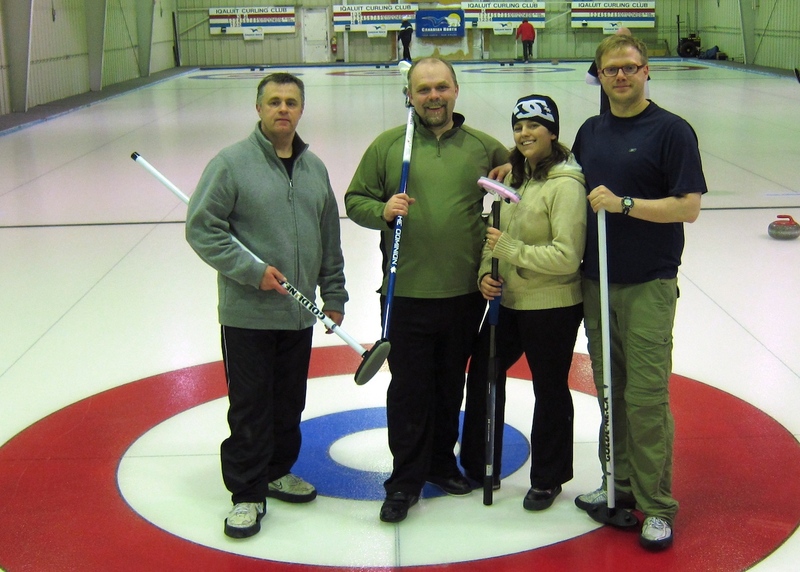 I think if you have to end a curling season, that's not a bad note to go out on at all. Alas, none of us won any of the plane tickets, although we all got nice prizes for winning. I grabbed a $120 gift card for the Frobisher, where I will take my lovely, curling widow wife out to supper when she next wants. I'll add two other things. First, the Canadian North is an awesome curling event. We can take 16 teams and the spots filled up pretty quick (although we had one drop out last minute due to an emergency). Canadian North provided, no kidding, six plane tickets. Five were door prizes and one was for the infamous frozen foot draw (slide on your bare foot on the ice. Closest shot to the button wins. $5 a shot, all money goes to the food bank). Plus there were tons of other door prizes. I also managed to get a cool 2010 Winter Olympics jacket. 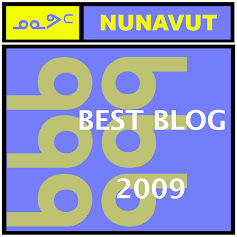 I will bet there is no event in Iqaluit where you have better odds of winning a plane ticket (by the time you discount the team who had to drop out, Canadian North employees and a few people who do not show up for the draw, the odds are about 1 in 13 of winning), plus be able to have an absolute blast. The second thing is that I'd forgotten how superstitious I can get over curling. 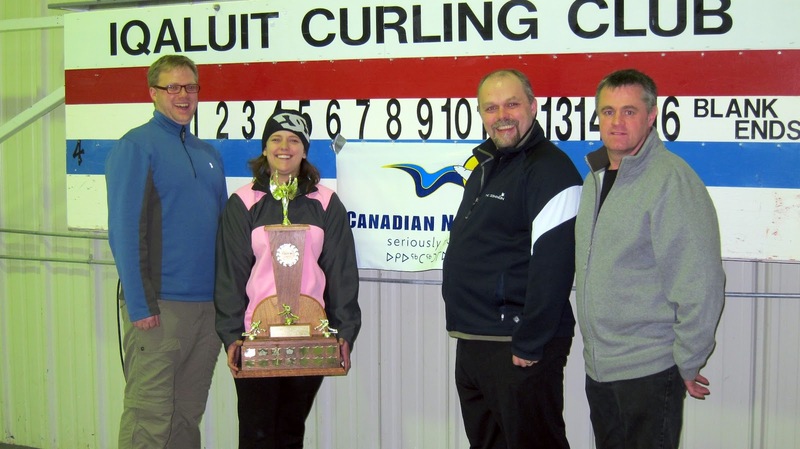 I haven't written about curling in recent weeks because, well, I was winning and not mentioning it on the blog, so let's keep that going. One of the play-off games happened on St. Patrick's Day so I wore a green shirt. And we won. So I kept wearing that shirt. I wore it for every game except one down the stretch. For that matter, I had a nice Olympic fleece Cathy bought at a house sale (for 50 cents. Insane) that I wore to a game early in the play-offs. The opposing team stole two points early, then I took the fleece off because I was warm. Next end, we took five. It was never worn at the club again. And so wraps up curling. I was at the club this morning helping to clean up and put things away. The City brought in the zamboni to try and get the ice off as they need the club for a banquet on Thursday (good luck with that). A rough start, but an excellent finish. Last year when the season wrapped up, I was done and looking forward to the break. This year, well, I'm looking forward to next season.